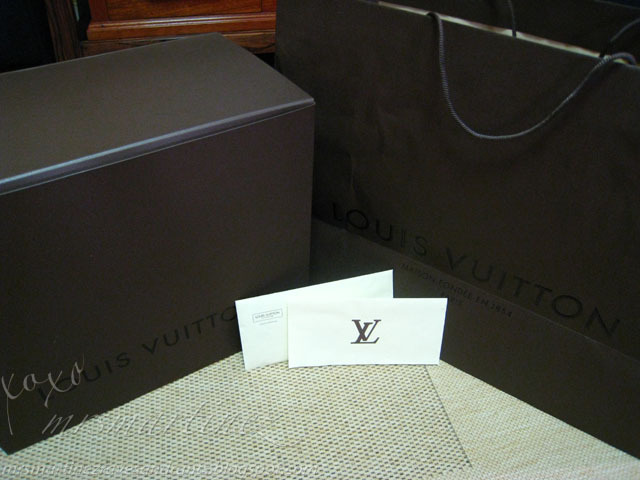 I purchased my very first LV bag in Louis Vuitton Central, Hong Kong. 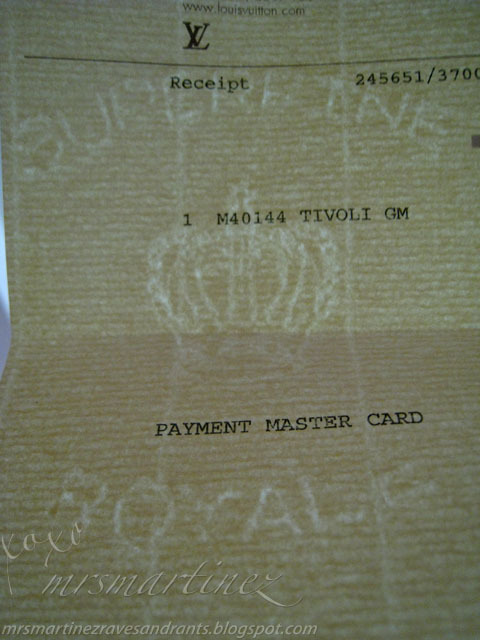 There is no doubt that I have the original Tivoli GM. It was first released in November/ December 2007. Here are some of the reasons I chose this brand- it NEVER goes on SALE, it has no OUTLET and the value appreciates with time because it is a prestigious brand. Contrary to what I have read online, when the SA gave me a new stock of the bag, the loose straps inside the bag were wrapped individually with plastic. 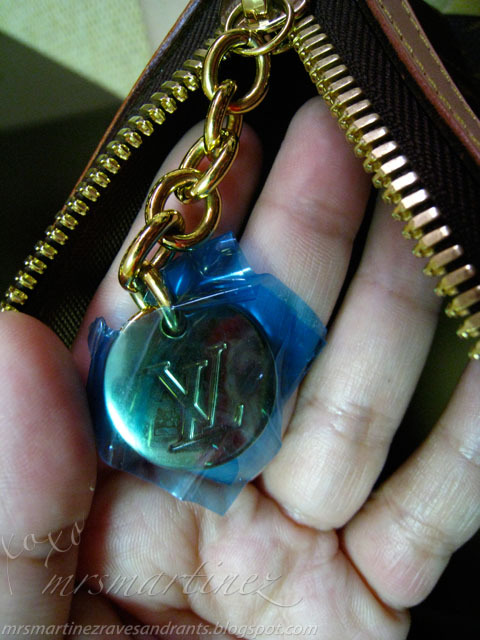 The brass buckles have paper inserts in between and the brass LV logo zipper pull is wrapped in a blue removable non stick plastic. Inside, there were 3 huge sheets of brown kraft paper. I don't know what to call this blue plastic. It's non-stick but it can adhere itself back to the zipper pull after I initially removed it. One thin ring connects the chain to the zipper. 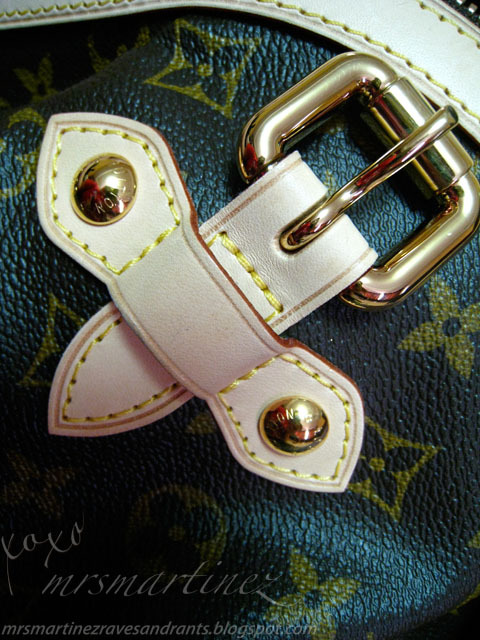 6 chains are interconnected to the zipper pull with LV logo on both sides. My first and foremost question to the SA when she showed me this bag was "Will the brass fade?". It has a lot of brass feature including the buckles and the bottom studs. From what I understand, the brass will not fade. Tip: There are 35 stitches each that meets at the center stud. 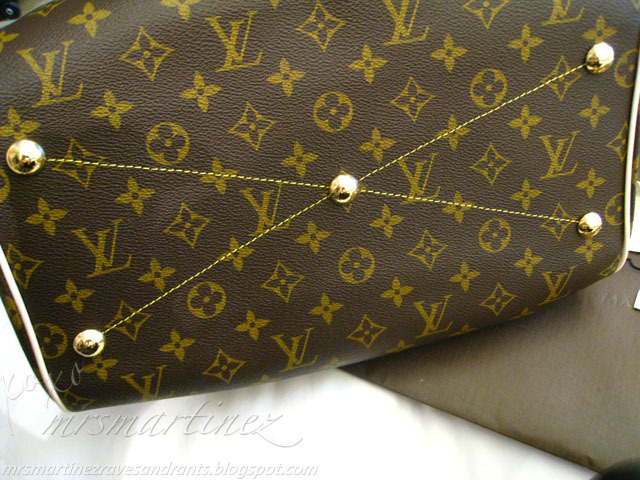 LV bags have the same number of stitches in the same model. The original receipt has LV logo printed in the middle, right side up when folded. When opened, you can see the watermark visible only when you take the receipt to the light. Words "MAISON FONDEE EN 1854"
Words " THANK YOU AND HAVE A NICE DAY"
Merchandise in its original condition may be returned for credit note or exchange within 1 month from the date of purchase with the original sales receipt in any Louis Vuitton stores within Hong Kong. Please retain your original sales receipt. The box is huge, definitely longer than our luggage when folded. After folding the scoring of the box, DH slightly curve its position inside the luggage. By doing so, there's only minimal visible crease when we got home. The box has a total of 4 rivets on both sides. A special kind of textured paper is used for the box. I didn't see any other print aside from the words Louis Vuitton clearly embossed with lamination on both sides of the box. 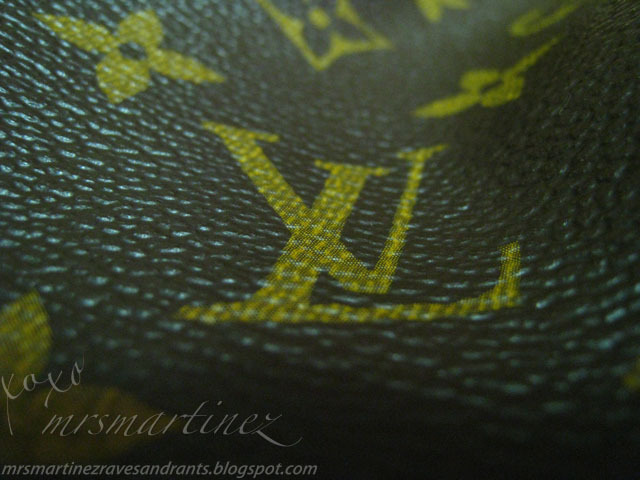 The name "LOUIS VUITTON" and the words MAISON FONDEE EN 1854 PARIS are embossed with 3D lamination in all caps and is printed on both sides of the paper bag. Found at the bottom are embossed letter and 14 numbers (412253 102 D61134) just above the words "PACKAGING MADE IN CHINA". There is also a base board of the same color. The dust bag's shape is more like an envelope when laid flat on the floor. I saw an attached tag on the inside lower right side seam that says "100% cotton Made in India" in two lines and 13364/O written on the side of the tag. 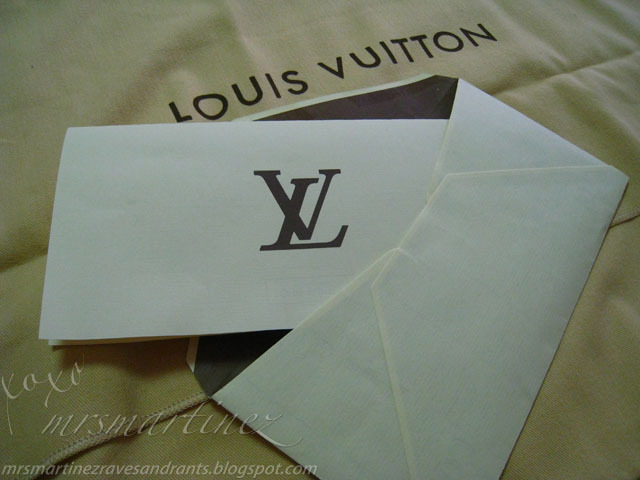 The words Louis Vuitton are written in the middle of the flap of the dust bag. 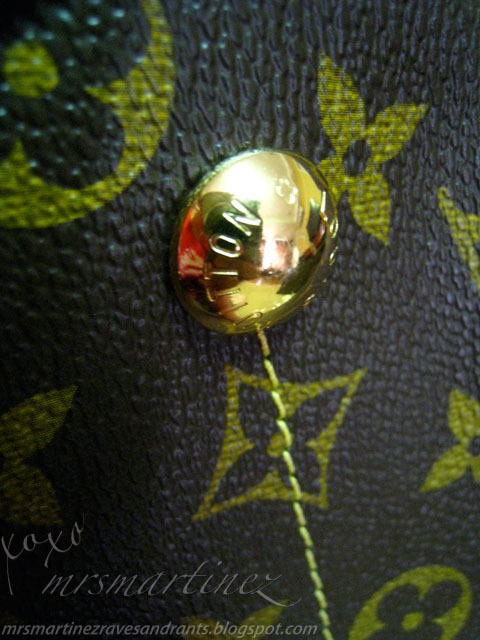 Tip: Not all styles of LV have an upside down LV logo. Any hand bags with a separate material on its side and bottom will have right side up on both sides. The monogram pattern should always begin and end with the same symbol in between the stitch lines. If it starts with a partial symbol, it should also end with a partial symbol. For visuals, read here. Tip: Always remember that the letters L and V can never be found on edges of the bag. It is usually strategically placed in the center of the bag and never near the stitches. 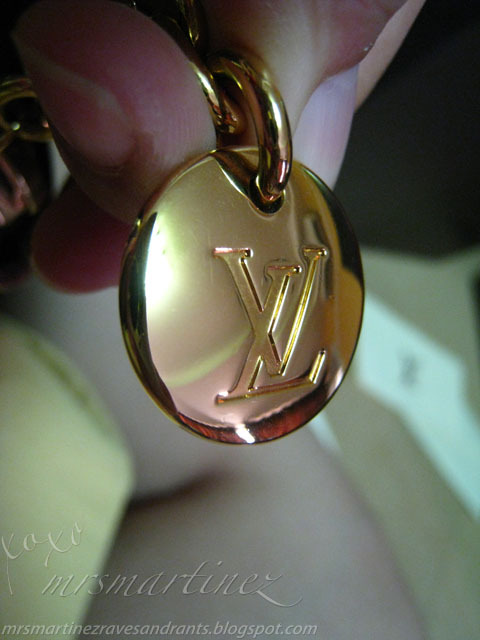 Learn more about LV brass hardware here. The LV patch's size is about (LxW) 1.5" x 1". It has horizontal 9 stitches and 6 vertical stitches. The color used in stitching is yellow. 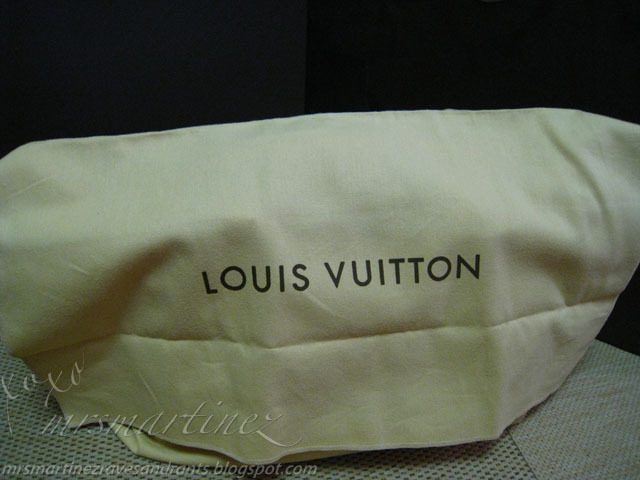 There is a registered trademark logo right above "Louis Vuitton" in between the letters "V" and "U". The letters are written in all caps except for "made in France". 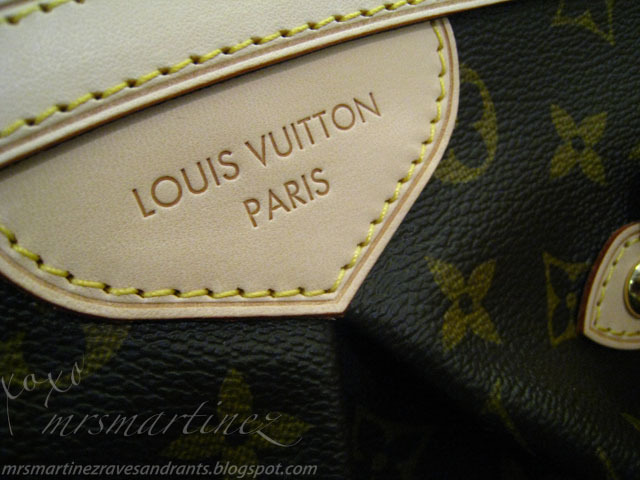 Tip: Louis Vuitton is also manufactured in Spain, USA, Germany and Italy. Read more about the font used in here. I found this LV tag included with my purchase. I found it in one of the three pockets of my bag. It was not attached to the bag. 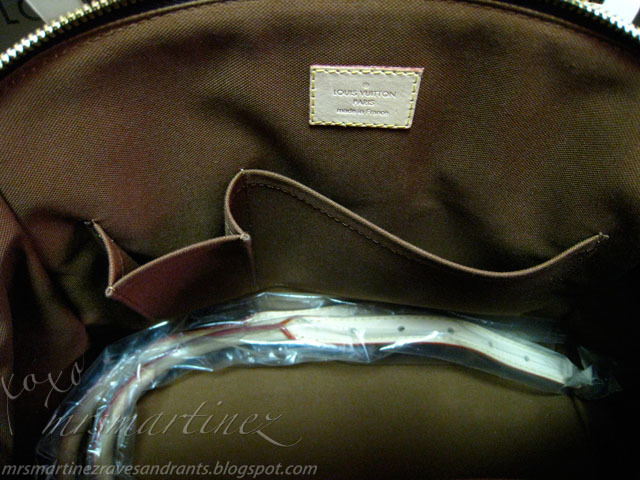 The tag includes the material used for the bag. 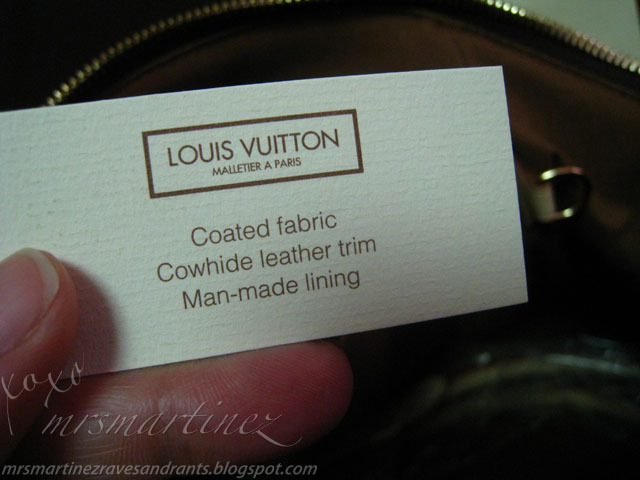 My tag read: Coated Fabric (Monogram design), Cowhide leather trim and Man-made lining. Other bags might have 2 tags but I only got one. The other one containing the model number (M40144), French name and the bar code. The date code or the production code is often hard to find. Luckily my bag's date code is just on the other side of the D ring. It is stamped with 2 letters and 4 numbers. The letters represent where it was manufactured (factory origin) while the numbers represent the week and year it was made. SP means it's Saint-Pourcain Sur Sioule LV workshop in France. Take the first and third number that's 2 and 1. It means that my bag was manufactured on the 21st week. The second and fourth number represents the year it was made. 11 means 2011. 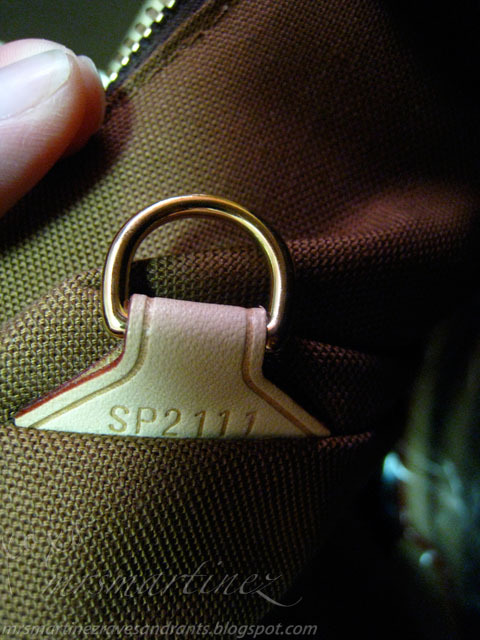 In essence, my bag was manufactured on the 21st week of 2011. To interpret the date code of your bag, visit this link and here. The color of the stitches used is the same as the lining, it's one continuous stitch. Same is true with all the stitches found outside with the ends parallel to each other if it's two stitches side by side. The number of connecting stitch is 3 stitches found at the back of the bag. This LV Tivoli GM is roomy and has a total of 3 pockets. The size is 18.1" x 11" x 7.9" (l x h x d). 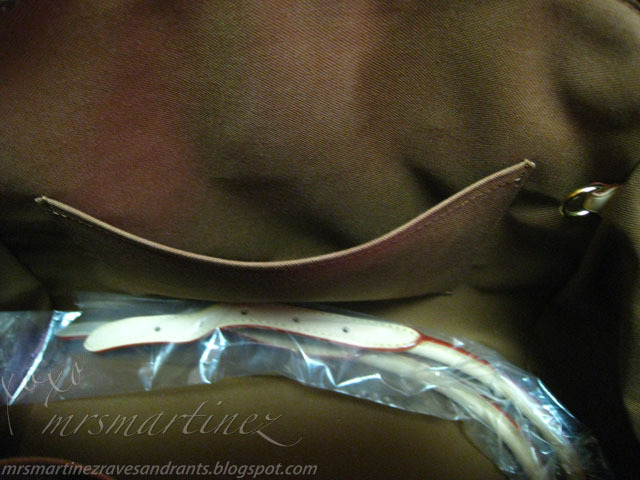 The adjustable strap drop length from shoulder to top of the bag is 6.5-7.5". The edge of an LV strap is dyed red. The leather handle will eventually oxidize and turn into a darker shade of tan. When up close, you will notice that the brown lines are visible under the printed gold letters of L and V. The L and V is not printed in solid colors. Source here. 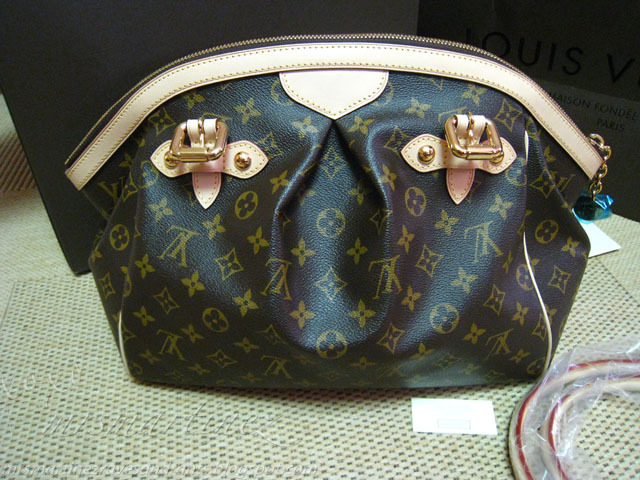 Before buying online, be wary of unscrupulous sellers which sell really cheap handbags. 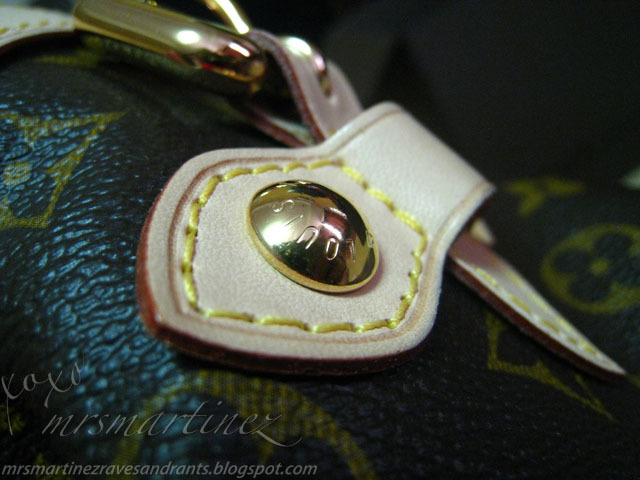 Do some research and read blogs like mine that gives helpful tips on how to spot a fake LV handbag. Or you can always visit Louis Vuitton site and check if the handbag you wanted to buy has the color and type which the seller is selling. 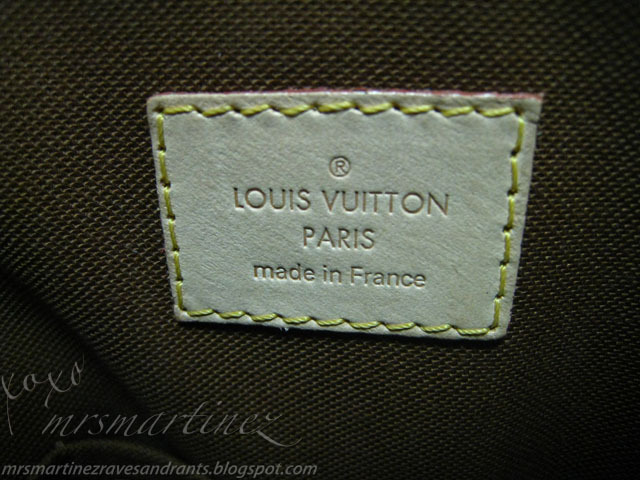 This is just a guide to help and give you tips on how spot a fake LV. With counterfeits getting better and better, it is harder to spot the fake each day. Let's us not buy FAKE, buy only the ORIGINAL. 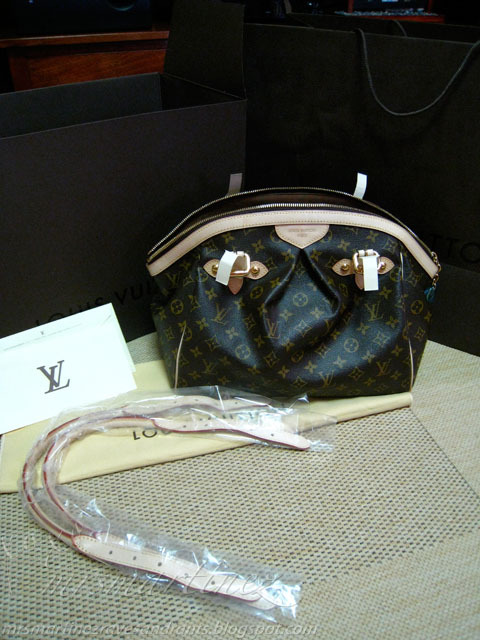 Visit Louis Vuiton LV forums for more info.